Martha Argerich, photographed in 2015. Martha Argerich (born June 5, 1941) is an Argentine pianist, widely regarded as one of the greatest pianists of the second half of the 20th century. 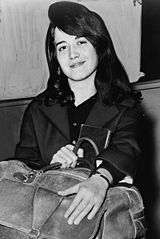 21-year-old Martha Argerich in 1962. Argerich was born in Buenos Aires, Argentina. Her paternal ancestors were Catalonians based in Buenos Aires since the 18th century. Her maternal grandparents were Jewish immigrants from the Russian Empire, who settled in Colonia Villa Clara in the Entre Ríos province—one of the colonies established by Baron de Hirsch and the Jewish Colonization Association. The provenance of the name Argerich is Catalonia, Spain. She started playing the piano at age three. At the age of five, she moved to teacher Vincenzo Scaramuzza, who stressed to her the importance of lyricism and feeling. Argerich gave her debut concert in 1949 at the age of eight. The family moved to Europe in 1955, where Argerich studied with Friedrich Gulda in Austria. Juan Perón, then the president of Argentina, made their decision possible by appointing her parents to diplomatic posts in the Argentine Embassy in Vienna. She later studied with Stefan Askenase and Maria Curcio. Argerich also seized opportunities for brief periods of coaching with Madeleine Lipatti (widow of Dinu Lipatti), Abbey Simon, and Nikita Magaloff. In 1957, at sixteen, she won both the Geneva International Music Competition and the Ferruccio Busoni International Competition, within three weeks of each other. It was at the latter that she met Arturo Benedetti Michelangeli, whom she would later seek out for lessons during a personal artistic crisis at the age of twenty, though she only had four lessons with him in a year and a half. Her greatest influence was Gulda, with whom she studied for 18 months. Argerich gave her debut concert at the age of 8, playing a concerto by Mozart. Argerich rose to international prominence when she won the seventh International Chopin Piano Competition in Warsaw in 1965, at age 24. In that same year, she debuted in the United States in Lincoln Center's Great Performers Series. In 1960, she had made her first commercial recording, which included works by Chopin, Brahms, Ravel, Prokofiev, and Liszt; it received critical acclaim upon its release in 1961. In 1967, she recorded Chopin's Polonaise, Op. 53. Argerich has often remarked in interviews of feeling "lonely" on stage during solo performances. Since the 1980s, she has staged few solo performances, concentrating instead on concertos and, in particular, chamber music, and collaborating with instrumentalists in sonatas. She is noted especially for her recordings of 20th-century works by composers such as Rachmaninoff, Messiaen and Prokofiev. One notable compilation pairs Rachmaninoff's Piano Concerto No. 3 (recorded in December 1982 with the Radio Symphonie-Orchester Berlin under the direction of Riccardo Chailly) with Tchaikovsky's Piano Concerto No. 1 (February 1980, Symphonieorchester des Bayerischen Rundfunks, Kirill Kondrashin). Argerich during a concert given in the Néstor Kirchner Cultural Centre, July 2015. Argerich is also famous for her interpretation of Prokofiev's Piano Concerto No. 3, Ravel's Piano Concerto in G, and Bach's Partita No. 2 in C minor, which she has recorded several times and continues to perform. Argerich has also promoted younger pianists, both through her annual festival and through her appearances as a member of the jury at international competitions. The pianist Ivo Pogorelić was thrust into the musical spotlight partly as a result of Argerich's actions: after he was eliminated in the third round of the 1980 International Chopin Piano Competition in Warsaw, Argerich proclaimed him a "genius" and left the jury in protest. She has supported several artists including Gabriela Montero, Mauricio Vallina, Sergio Tiempo, Gabriele Baldocci, Christopher Falzone  and others. Argerich is president of the International Piano Academy Lake Como and performs each year at the Lugano Festival. She also created and has been General Director of the Argerich Music Festival and Encounter in Beppu, Japan, since 1996. Her aversion to the press and publicity has resulted in her remaining out of the limelight for most of her career. Nevertheless, she is widely recognized as one of the greatest pianists of her time. Her performance of Liszt's First Piano Concerto at Proms 2016 prompted this review in The Guardian: "It was an unforgettable performance. 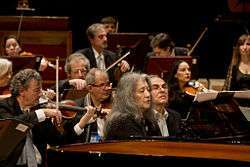 Argerich celebrated her 75th birthday in June this year, but that news doesn’t seem to have reached her fingers. Her playing is still as dazzling, as frighteningly precise, as it has always been; her ability to spin gossamer threads of melody as matchless as ever. This was unmistakably and unashamedly Liszt in the grand manner, a bit old-fashioned and sometimes even a bit vulgar at times, but in this of all concertos, with Barenboim and the orchestra following each twist and turn, every little quickening and moment of expressive reflection, it seemed entirely appropriate." Argerich has been married three times. Her first marriage, to composer-conductor Robert Chen (Chinese: 陈 亮声; pinyin: Chén Liàngshēng), and with whom she had a daughter, violinist Lyda Chen-Argerich, ended in 1964. From 1969 to 1973, Argerich was married to Swiss conductor Charles Dutoit, with whom she had a daughter, Annie Dutoit. Argerich continues to record and perform with Dutoit. In the 1970s she was also briefly married to pianist Stephen Kovacevich, with whom she has a daughter, Stéphanie. 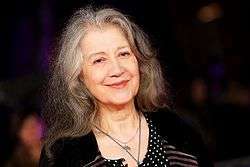 In 1990, Argerich was diagnosed with malignant melanoma. After treatment, the cancer went into remission, but there was a recurrence in 1995, eventually metastasizing to her lungs and lymph nodes. Following an experimental treatment at the John Wayne cancer institute in Santa Monica pioneered by oncologist Dr Morton, Argerich's cancer went into remission again. In gratitude, Argerich performed a Carnegie Hall recital benefiting the Institute. As of 2016, Argerich remains cancer-free. Stéphanie Argerich Blagojevic directed a documentary film about her mother, Bloody Daughter, based on film shot since her childhood. Diamond Konex Award 1999 as the most important Classical Musician of the decade in Argentina. Voted into Gramophone's Hall of Fame in 2012. Recipient of The Kennedy Center Honors in 2016. ↑ Ross, Alex (12 November 2001). "Madame X". The New Yorker. Retrieved 15 January 2014. ↑ Tommasini, Anthony (20 March 2005). "Classical Music: Recordings; Boisterous Beethoven, Brooding Brahms". The New York Times. Retrieved 15 January 2014. ↑ Carrizo, Rodrigo (2013-01-24). "Examining a Martha-daughter relationship - SWI". Swissinfo.ch. Retrieved 2015-09-04. ↑ Tommasini, Anthony (2000-03-25). "An Enigmatic Pianist Reclaims Her Stardom". The New York Times. ISSN 0362-4331. Retrieved 2016-02-04. ↑ "La vida de una pianista única: "Martha Argerich" por Moshé Korin". Lavozylaopinion.com.ar. Retrieved 2013-10-21. ↑ "Portrait : Martha Argerich - Arts-Scènes". Owl-ge.ch. Retrieved 2013-10-21. ↑ Niel Immelman (14 April 2009). "The Guardian, 14 April 2009". London: Guardian. Retrieved 2012-01-04. ↑ Elder, Dean. Excerpts from a Rare Interview with Argerich. accessed 19 January 2010. ↑ Andrew Clark (2011-07-08). "Strains of mood music". Financial Times. Retrieved 2015-07-24. ↑ "YouTube". YouTube. Retrieved 2013-10-21. ↑ "About". Chopin International Competition. Retrieved 17 January 2014. ↑ "Jury". ASU Competition. Retrieved 17 January 2014. ↑ "Ninth Competition". Arthur Rubinstein Competition. Retrieved 17 January 2014. ↑ "Classicalrecitals". YouTube. 2009-11-03. Retrieved 2015-09-04. ↑ "Progetto Martha Argerich" (in Italian). Rsi.ch. Retrieved 2012-01-04. ↑ "Progetto Martha Argerich" (in Italian). .rsi.ch. Retrieved 2015-09-04. ↑ In a 2001 article about Martha Argerich for The New Yorker, critic Alex Ross wrote: "Argerich brings to bear qualities that are seldom contained in one person: she is a pianist of brain-teasing technical agility; she is a charismatic woman with an enigmatic reputation; she is an unaffected interpreter whose native language is music. This last may be the quality that sets her apart. A lot of pianists play huge double octaves; a lot of pianists photograph well. But few have the unerring naturalness of phrasing that allows them to embody the music rather than interpret it." ↑ "West-Eastern Divan Orchestra/Barenboim/Argerich review – extraordinary in every respect". The Guardian. 2016-08-18. Retrieved 2016-11-15. ↑ "二十八国华人演奏家"百鸟还巢"". News.163.com. Retrieved 2012-12-11. ↑ "Lyda Chen-Argerich, violinist". Sens Management. Retrieved July 2, 2014. 1 2 Hauptfuhrer, Fred; Vespa, Mary (1980-04-07). "A Top Woman Pianist, Martha Argerich, Nearly Gave Up Her Steinway for Steno". people.com. Retrieved 2014-07-02. ↑ "Martha Argerich Speaks to Stephen Kovacevich". Gramophone.co.uk. November 2008. Retrieved 2015-10-27. ↑ Leslie Felperin (2015-04-30). "Argerich review – a daughter's honest portrait of her classical-pianist mother". The Guardian. Retrieved 2015-07-24. ↑ "Storia del Concorso - Fondazione Concorso Pianistico Internazionale Ferruccio Busoni". Concorsobusoni.it. Retrieved 2013-10-21. ↑ "Gramophone Hall of Fame : Artists Page". Gramophone.co.uk. Retrieved 11 April 2012. ↑ "The Kennedy Center Honors". Kennedy-center.org. Retrieved 2016-08-09.